Ben: here’s a guest post from one of our great community members, Alex Eames, who’s providing his Kickstarter-funded HDMIPi screens to a UNICEF education project in Lebanon. At the end of December 2013 James Cranwell-Ward (@jcranwellward) a Technologist working for UNICEF Lebanon emailed us about HDMIPi. In case you don’t know, HDMIPi is a 9″ low cost, High Definition (1280×800) HDMI screen for the Raspberry Pi, which was crowdfunded on KickStarter in November 2013. James was only going to be in the UK for another couple of days and wanted to talk to us about our screen. It looked like exactly what he needed for a large Raspberry Pi based project to help educate displaced Syrian children in Lebanon. The idea is to have a low-cost computer, containing educational materials, such as Khan Academy Lite, to help get these Syrian children, whose lives have been so drastically disrupted, back into learning. James is a technologist in the Innovation section of UNICEF, where they use private sector knowledge to assist UNICEF with their projects. He had a couple of Raspberry Pis on his desk and one day his boss walked by and asked about them. James gave a demo and a plan was hatched. But they needed an inexpensive screen. That’s where HDMIPi came in, freshly out of crowd-funding. At the time, we had our two KickStarter prototypes and just one other working screen, which we gave him (uncased) when Dave Mellor (@Cyntech1) went to meet him in London. He took it back off to Beiruit and made an initial prototype, which he blogged about in February. Fast forward a couple of months and James is getting ready for a large Raspberry Jam to kick off the Raspberry Pi for Learning (Pi4L) project. He needed 50 units, but we’re not quite into production yet because we’re implementing several new Pi-specific features on the driver board. So our supplier found us a similar but different (more expensive 10″) option that could meet the interim need. But could we handle the case too? Eek! Jon then worked double-time at the weekend to get these laser cut (big thanks and much kudos). Paul took a couple with him to the San Francisco Maker Faire last week. He said they generated a lot of interest. What I am most excited about going forward is a new project which will see the launch of an e-learning initiative in refugee camps, which will be piloted for 3 months this summer. It’s untapped ground and it will be really interesting to see what e-learning can do in a context where schools are drastically overrun and there are just not enough school places for children. 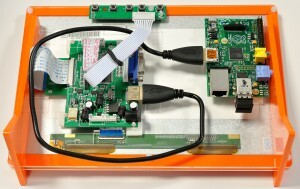 The e-learning programme consists of 3-4 courses delivered on a new cheap computer called a Raspberry Pi. There will be basic literacy, numeracy and science, content based on Khan Academy produced by the Foundation for Learning Equality. We are also going to run a programme called ‘learning to code and coding to learn’. Children will be able to explore how to make games whilst also learning about their rights as a child. It’s a learning activity and it is also fun. There will be another course for teachers, so they can support the children as they start using these tools. In every location the summer school is running – from schools to refugee camps, we are going to leave the lab in place once the summer school is over so it will be a permanent installation. This will mean that beyond the summer programme children can continue to learn and develop using these tools. We are very excited and delighted to be able to be involved in a project that could actually “make a difference” for large numbers of children. Who would have thought, when we started the HDMIPi project a year ago (I’ve just renewed the domain) that a small, portable, inexpensive screen for the Raspberry Pi might find its way into a UNICEF project like this? But now I wouldn’t be at all surprised to see lots of ‘developing country’ projects involving the Raspberry Pi in the next couple of years. It’s a very good fit. 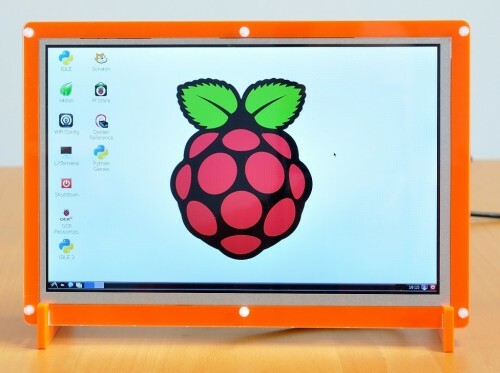 The 9″ HDMIPi should be in production soon. We hope to ship KickStarter rewards towards the end of June. We’d like to emphasise, to those who backed HDMIPi on KickStarter, that this UNICEF project has not and will not delay fulfilment of their rewards. To pre-empt the question, as I will be away on holiday when this article goes live, the case shown here in the UNICEF prototypes is different from the standard HDMIPi case. But, no doubt, if there is demand, alternative case(s) will spring up in due course. 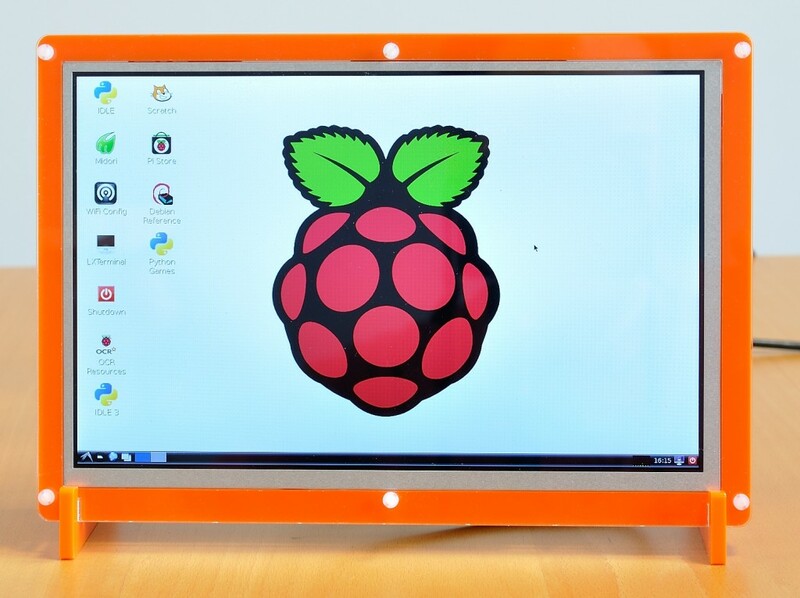 +1 for the pimoroni case, it makes the screen WAY more attractive! Congratulations everyone with this wonderful result! Definitely agree that a great job has been done on the case (particularly given the short time they did it in). They look fantastic and a welcome change to all the dull black monitors surrounding me. I got my Pi and case from the Pimoroni chaps when I found out they were housed just over the Don in Sheffield. Got a nice tour and saved on postage, lovely folks! great spirits always come with great thoughts and their footprints always the history. Thank you for remembering. The UNICEF action is quite a good PR for the HDMIPI project. I’m sure others will follow if you manage to keep prices down. I’m uber excited now for my HDMIPi to be delivered. Great product for an immediate need with undoubted potential for the future .. I know it doesnt need to, but would a Pi run the KeePod OS ? I’d never heard of KeePod before, but http://www.bbc.co.uk/news/technology-27346567 says it’s based on Android, so no it won’t run on a Pi. But in a similar fashion, Raspberry Pis already boot from a removable storage device (in this case an SD card rather than a USB stick) so each child could have their own personalised Raspbian SD card, and all share a single Pi. Great project. Respect! Will you buy your Raspberry at RS Components? They are one of 2 distributors who bought the rights to manufactur the Pi. Maybe they offer you some discount if you involve your Unicef story. Some comments seem to have disappeared – including mine, which was totally harmless and applauding the project. And asking for an easy way to donate, which I still think, would be cool. The Pi is programmable, small and contains I/O that allow it to control other devices. These features make it an amazing building block for projects that inspire people to learn programming. Using a Pi to build something like a robotic car, music synthesizer, garden spinkler, automatic door and so forth is motivating because it puts the person back in control of the technology. In this way the Pi is a good device for supporting school curriculia that focus on reading and writing computer programs. This, in turn, promotes a creative work-style method of learning which is important for any science, technology, engineering or mathematics related subject. Please don’t let the delivery of courseware take priority away from all the interesting educational uses for the Pi. really great, thanks those developers doing a great job. Looks like a great idea. My only concern is how a Raspberry Pi will handle the KA Lite software. According to the KA Lite documentation they cannot currently function as clients due to difficulty playing video. Beautiful initiative! I have been wanting to work on something similar to this with Pi for the education domain. Just instead of extracting from KA videos, I wanted to develop blender/Maya simulations for learning things, in a format that has quizzes and games in between to enhance the learning process and build related memory. Something similar to what udacity and coursera offer, but in an animation setup because I believe that captures a longer span of attention for even adults, let alone kids. Where can we buy B+ in Lebanon ?